The property includes the main house, residence of the owner, and the Retreat Center. The Retreat Center includes the Main Hall, an open porch, a screened in porch, a full kitchen, a dining table, 3 bedrooms, 2 bathrooms, and plenty of closet and storage space. Chairs, cushions, zabutons, meditation benches and yoga mats are available. The grounds include 6 ½ acres of landscaped and natural spaces with a small waterfall, stream, pond, pool, hot tub, lounge chairs, covered patio, barbecue grill, hammocks, and an outdoor table and chairs. In addition, the porch of the main house, which has wooden rockers and a mattress-swing, is accessible. 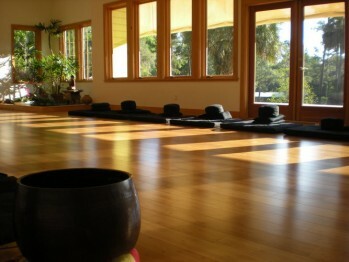 The Main Hall is a gorgeous open space with wooden bamboo floor and an interior garden measuring 700 square feet. Windows have a full view of the pond and surrounding landscape. It opens to two outdoor porches, one of them screened. Behind the main hall, separated by wooden doors is a full service kitchen with a stove, oven, refrigerator, dish washing machine, microwave oven, cabinet space, plates, glasses, cutlery, cooking utensils, dining table for 6 people, 2 folding tables for 8 people each as well as 20 stackable chairs if needed. On one side of the Main Hall is a 215 square foot screened-in porch, comfortable lounge chairs to take in the view. 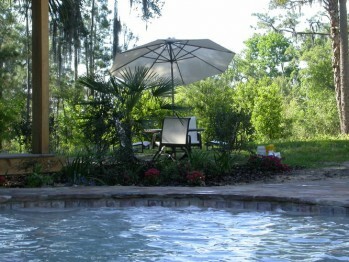 Enjoy the silence, sounds of nature, and view from the porch overlooking the pond, palms, pines, oaks, and Spanish moss, the natural vegetation of this area of Florida. In front of the Main Hall is an outdoor 560 square foot wooden porch from which you may see the sunrise while meditating, learning or doing yoga. Mats and cushions are provided. The first and second bedrooms have two single beds each. The third bedroom has three single beds. There are 2 full bathrooms shared by the three rooms. The grounds include 6 acres of landscaped and natural areas. A footpath leads from a small waterfall along a stream to a pond, gazebo, and wooden meditation gong in a stone garden. A pool, hot tub, lounge chairs, covered patio, barbecue grill, hammocks, and an outdoor table with chairs are available for your use. 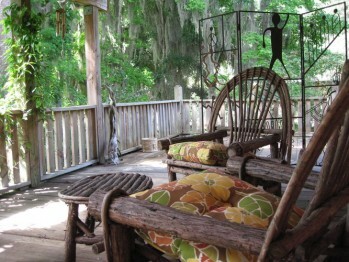 In addition, the porch of the main house, with its wooden rockers and queen size mattress-swing, is also accessible. Additional lodging is available at the Herlong Mansion Historic Inn and Gardens, five minutes away in the town of Micanopy. This bed and breakfast is listed on the National Register of Historic Places, and dates back to the early 1800’s. You may reserve a room by contacting them directly. Click here for more information about the history of Micanopy and area attractions.